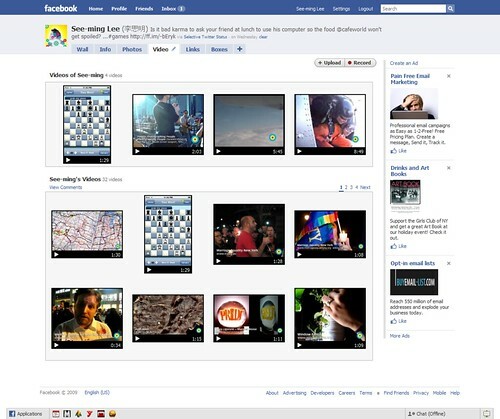 I usually simulcast my videos on multiple video social networks: Facebook, Flickr, Vimeo and YouTube. Many people ask me why I do this, so I thought that I would give give an analysis of these video networks, the pros + cons of posting to them, and the audience that they tend to attract. Facebook is a closed network, so your Facebook friends will see your videos but if you intend your videos to be viewed by people who are not in your network, you are out of luck. While Facebook allow you to share the video with people outside of the network, it will never get indexed by search engines, so you will never get search traffic from it. This is good for personal videos, but for the sake of journalism / photojournalism it is possibly useless unless you have a very large following. One benefit of posting to Facebook though is the people tagging feature. If your video is about a particular person, tagging them will auto-alert them so you don't have to let them know via emails. Additionally, if you tag the person who is also on Facebook, it will then get posted to that person's wall, which can potentially reach the friends of the person's Facebook friends, reaching an even larger audience. Further, since your Facebook network is likely composed of people you actually know (compared to your Flickr / Vimeo / YouTube contacts who may likely be people you have never met in person, the likelihood of them checking it out is higher even if the video subject matter does not immediately interest them. Most of my videos feature still photography, and since Flickr has traditionally been my social network stronghold (I have 3,000,000+ views on my stream), so it makes sense for me to post to Flickr. I could also link the still photography references in the description area so if someone sees something in the video that video that they would like to use per Creative Commons, they can find the source within the network. Groups on Flickr are diverse and plentiful. This means that you can post your video to a very targeted audience, often outside of your existing social networks (aka contacts). One annoying aspect of Flickr videos is that there is no way for you to set a thumbnail, so even if the thumbnail selected by the system is not the a good representation of your video, you are pretty much stuck with it. There is a video duration posting limit on Flickr. Videos can be up to 1 minute and 30 seconds. If you post videos that are longer than that, they will be 'cropped' automatically. If your video is longer than 1:30, what you can do is post a 90-sec clip teaser / trailer on Flickr and then refer to your video posted on other network. I usually try to keep them all at the same length unless it is impossible to do it in a single go. This limitation has in fact got me to be a better video editor — constraints tend to drive better creativity. Sometimes the videos (mostly interviews) can be broken down into multiple parts anyway, and I post these clips separately. You might get a higher view anyhow as it's a lot to ask someone to sit through a 10-min video, but if someone like your first 1:30 clip, chances are they are more likely to check out the other video parts. Vimeo provides many social features not found on other networks. You can tag people who appear in the video, but you can also provide credits and set different roles for people who were involved in the production. 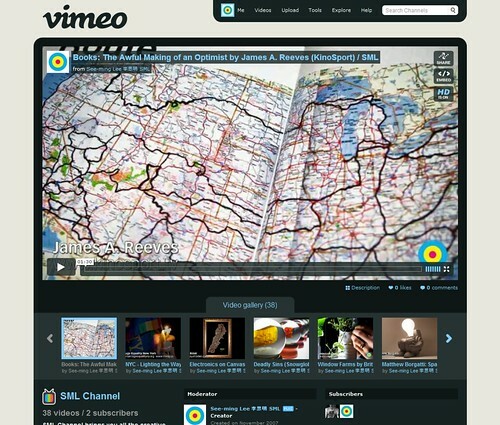 On Vimeo, you can reference still photography directly. If you provide your photo URLs, Vimeo will display those photos / stills from the video on the video page. This is helpful in cases where others wish to blog about your video or post to image sharing networks. I wrote a bash script to facilitate this process more easily: flickr2vimeo (hosted on github). This is how it works: open up a Flickr page in your browser with all the images you wish to include. This may be a set page, photos from tags, whatever. Make a selection of of those photos and then view selection source, copy and paste those HTML in a file and run the script in your shell: it will then dishes out the comma-separated URLs that Vimeo requires. I am sure that there is a more elegant way of doing this, but it works for now. Eventually I would like to allow tag input or URL input so I won't have to do the selection source step - feel free to develop on top of it! Vimeo requires your content to be original, and prohibits commercial postings, as such, there is a relatively large and active art / filmmaker following. So this is a network that you should definitely post to if you have contents in this area. 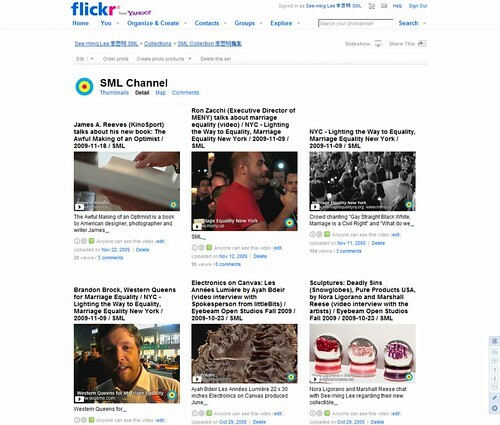 Like Flickr, Vimeo has a diverse and committed community who participate in groups, and posting your videos to those groups will allow you to reach a larger and targeted audience more easily. On top of your user page, it is very easy to create your own channels, albums, etc. If your videos are episodic, this is very beneficial as they get clustered nicely without additional navigation. If you wish to reach the largest audience on the Internet, YouTube is your best bet. YouTube is free and natively support HD content. Vimeo supports HD but you will have to pay extra for HD embedding. The same is true for Flickr. 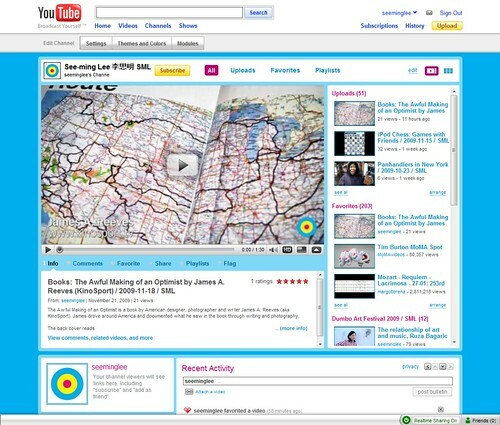 YouTube is own by Google, so there is a very good chance that it will get indexed by Google servers almost instantly. If your video is time-sensitive, news-worthy or viral in any manner, it has high value as they also show up on Google web search results. Your videos will likely show up on Google video search as well. And while Google Video does index Vimeo and Flickr videos, the Google interface will not play those videos directly from the search results page. So again, if you are doing journalism / photojournalism and intend to reach the largest audience, YouTube is your friend. One additional aspect regarding YouTube that is often overlooked is YouTube's partnership agreements with multiple mobile devices and consumer electronics. For example, Safari on the iPhone / iPod touch does not support the Flash player, so you can't really see video content on Vimeo, Flickr and Facebook natively. You can sometimes see video on Flickr and Facebook if you use their iPhone app, but on occasion they just won't play. I don't know if there are just kinks on those apps that the developers need to work out, but the YouTube app will play everything. YouTube's iPhone app also plays the highest quality video among others: the Flickr video in the Flickr app is often choppy and leaves much to be desired. YouTube on Apple TV is also top notched. HD videos is so much sexier on the 100" projector!